Providing you the best range of side face cutters with effective & timely delivery. The Side Face Cutters we manufacture have gained tremendous appreciation in the market for their host of exclusive features. These are developed using high speed steel of M2, M35, M42 and T42 grades. 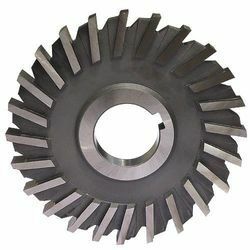 The side and face cutters can also be customized to generate required form as per client's description. We use ISO standard carbide indexale inserts. Our range is properly head treated as per the steel selected. The range is extensively used for machining of deep slots, T slots, special profile and others.